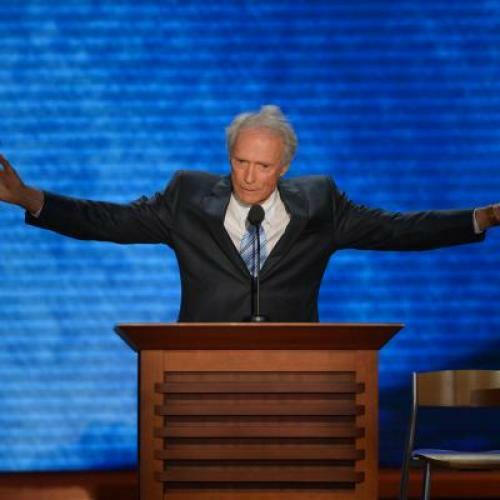 The worst part of Clint Eastwood's RNC speech last night wasn't that empty-chair prop. It was how very, very old he seemed. It wasn't just the line where he acted as if student loans were some sort of newfangled gollywizz that President Obama was silly to be concerned about. It wasn't his appearance, necessarily—the man still has diamond-sharp cheekbones at the age of 82. It was his wandering delivery, his downcast eyes, his general air of having wandered off an old-folks home to tell a few jokes to a crowd with a better sense of humor than the nurses who'd been assigned to his care. The terrible spectre of aging was all I could think about as Eastwood was talking. With any luck, someday I'll be that old; my parents will be sooner. It's terrifying and hard to get old, even if you're as healthy and wealthy as Eastwood. Most people aren't, and they need things like ... "entitlements." And so I have to wonder if Eastwood wasn't exactly the worst person to bring out last night to tout a ticket that hasn't shied away from taking an axe to the Medicare budget, a reminder of all the tough stuff that serves as mortality's advance guard. It's easier to forget about the inevitability and difficulty of old age when you're staring at someone who probably gets carded every once in a while. Eastwood the director surely approves of the Paul Ryan casting; he probably should have been wise enough to resist his own cameo.